Actor James Franco repeatedly called the all-new BMW i3 electric car an ‘electronic’ car while promoting the vehicle at BMW’s London launch party on Monday. From Harry Osborn in the Spiderman series to his recent portrayal of Oz in Oz the Great and Powerful, James Franco has been known for his eclectic film roles. Despite this, it appears that Franco has finally met his most challenging role yet: the Car Guy. 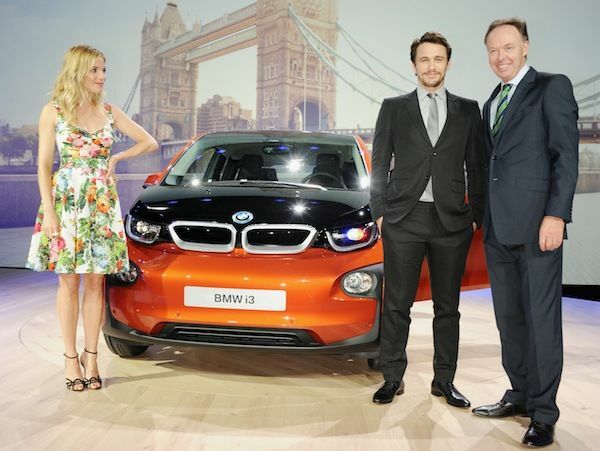 On Monday, BMW invited Franco—along with fellow movie star Sienna Miller—to attend the London launch party for the 2014 BMW i3 electric car. Although BMW probably thought it was a good idea to attach a celebrity face to their product, Franco did not do the automaker any favors. In fact, Franco appears as if he has zero knowledge of the vehicle whatsoever. Worst of all, the actor refers to the BMW i3 as “electronic” on more than one occasion. Aside from being “just cool,” the BMW i3 is BMW’s first zero emissions mass-produced vehicle, and the first production vehicle to feature carbon fiber reinforced plastic. The five-door hatchback touts a 170 HP internal combustion engine, which is backed up by a synchronous electric motor, and a 22 kWh lithium-ion battery. The i3 also touts a simple speed automatic transmission with fixed ratio. The vehicle’s official range is 80 to 100 miles, and up to 120 miles in its most efficient driving mode. The i3 is set to go into mass production this year and will be available in Europe this November. The BMW i3 will hit U.S. dealerships in the first half of 2014 with a $42,275 price tag (not including government incentives). In addition to Franco and Miller, BMW's debut party also featured UK celebrities like supermodel Poppy Delevingne, Ben Hudson (lead singer of Mr Hudson), model Peaches Geldof and Guinness heir Jack Guinness. What do you think of automakers using celebrities like Franco to promote their product? Does the celebrity association make you more or less likely to buy the BMW i3?